“What if Jesus came back? What if he was bricking your car on the Saintfeld Road? 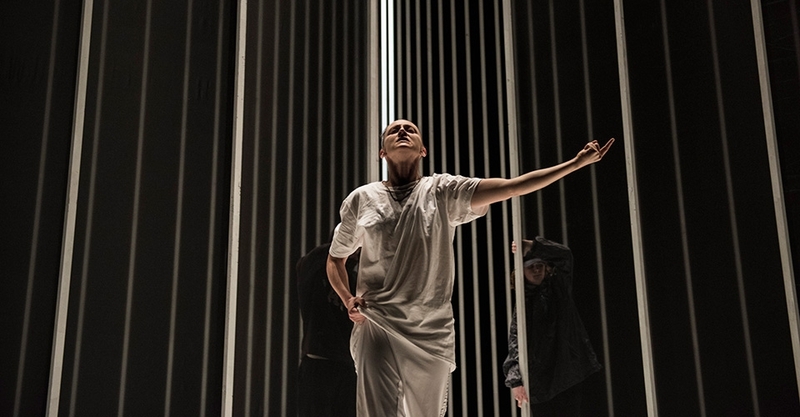 This is a new work by Belfast based Choreographer Oona Doherty. She has assembled an impressive team around her for this production, including music by David Holmes and Set Design by Ciaran Bagnall. The work is broken into four parts and aims to discuss life in Belfast today. The most striking thing as you enter the theatre is the smell of incense in the air. The production opens with it being burned at centre stage giving memories and suggestions of all things ecclesiastical and the religious divide in the city. The first of the four parts has a dancer at the front of the stage performing while a series of interviews are played in the background. The second segment has a crew of young female dancers dressed in track suits. Their movement is loose and free form, with a certain sense of abandon. 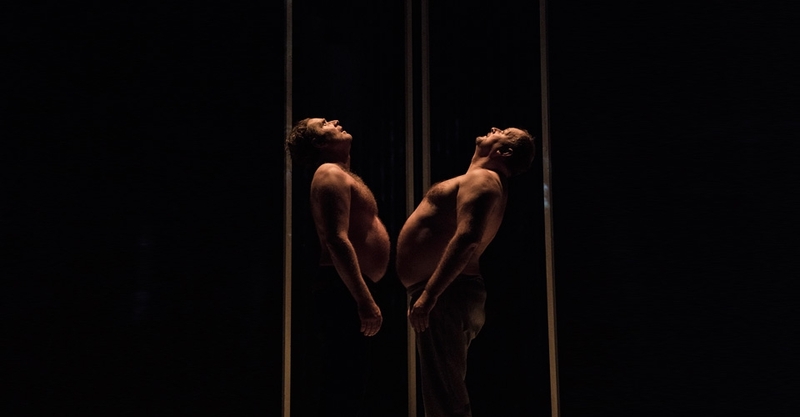 The next part was possibly the most striking, as two bare-chested older men start at opposite sides of the stage and slowly work towards each other. They meet centre stage and grapple, wrestle and eventually hold each other. The final sequence has another solo performer to end the hour-long piece. The set is quite striking, as it is effectively a massive cage filling the full of the abbey stage. The adaptable space allows the performers to dance in front of it and inside it at various times. The long vertical bars of the cage are not evenly spaced and it allows for a variety of optical tricks which work well with the lighting design, again by Ciaran Bagnall. The music by David Holmes is also quite powerful. Holmes has worked as a DJ and composer for over twenty years and has created Hollywood soundtracks such as Ocean’s Eleven. For this, he has developed a soundscape with electronic and orchestral sounds with many rousing and euphoric moments. The production aims to be a reflection of contemporary life in Belfast and explores issues such as “masculinity, sectarianism, culture, class and sexuality”. There are interviews with people from Belfast dotted throughout the piece that give the audience a clear grasp of the issues and ideas being explored. The four different sections make the work very diverse, with many contrasting ideas being explored. Oona Doherty is right at the forefront of Irish dance and this work only enhances her reputation. 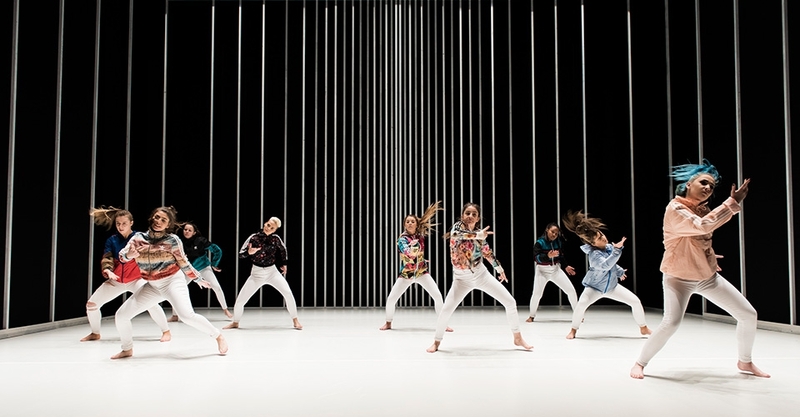 Performers: Oona Doherty; Ajendance Youth Dance Company featuring Ellen Burns, Lucy Burns, Lynn Gourley, Rachel Harris, Zara Janahi, Niamh McErlane, Beatriz Pina, Caitlin Shaw & Nicole Wray; Bryan Quinn & John Scott.